The Fricke house was designed in 1901 and is frequently dated 1902 as that was when construction was probably finished. 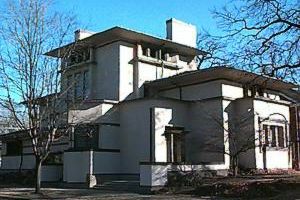 The house is one of the first completely mature Prairie Style designs by Frank Lloyd Wright. By the time of this design, Wright had dropped all classical or historical elements from his designs. All lines are rectilinear, all moldings have sharply square corners. Take a another look.